Trae Young is off to a strong start to his career—just not in the exact way we expected. In “Rookie Review,” I check in on one of the interesting rookies this season. 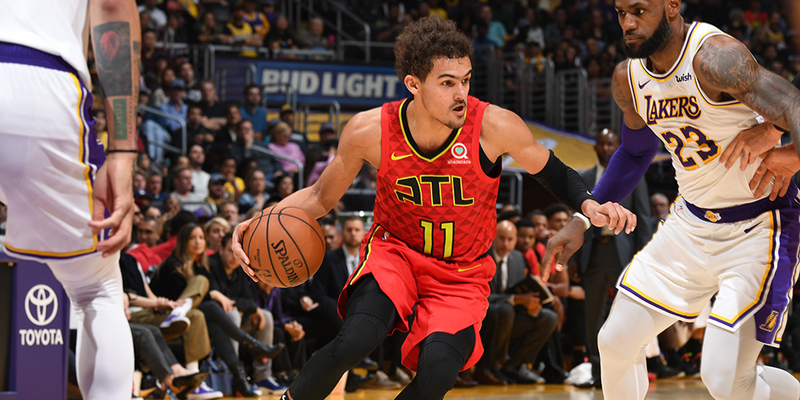 Today I take a look at the recent Hawks/Lakers game, zooming in on Trae Young’s surprising play so far this year. At this time last year, Trae Young wasn’t even viewed as a first-round pick. ESPN released a list of their top 10 point guards in the 2018 draft, and Trae Young didn’t appear on it. It didn’t take long for scouts to recognize their mistake, though. By the end of November, Young was climbing draft boards. By the end of December he was a lottery shoo-in. That meteoric rise was fueled by Young’s incredible production. He put the Oklahoma Sooners’ offense on his back, with a sky-high usage rate. And Young wasn’t just a long-range chucker, as much as his pull-up 30-footers may have made it seem that way. He scored with above-average efficiency and found teammates all over the court, posting by far the highest assist rate in the country. But there remained questions about whether he could translate that production to the NBA level, mainly because Young does not have a prototypical NBA body.